With keen ears, keen eyes, binoculars, and cameras, my friends and I are ready to watch the birds. On Wednesday mornings we like to gather for a leisurely hunt to discover which birds are active in a small suburban park, just twenty acres tucked in behind a busy shopping mall. Cars and trucks and then a school bus zoom past us on the four-lane boulevard just fifty feet away on our left. An ambulance with sirens squealing passes by on the way to a nearby hospital. We tune all that out and amble slowly along on the paved path near the south edge of the park, in no particular hurry. We’ve already spotted a small group of streaky brown-and-beige female Red-winged Blackbirds and watched them flutter down to alight in the cattails in the swampy area. The shiny black males are nowhere to be found. We walk forward and then step to the side of the path to let a woman walking her dog pass us. We take a few more steps forward. We pause again, turning our heads at the sound of the rattling call of a bird approaching from the right. We follow the dashing flight of a Belted Kingfisher as it barrels along a few feet above the creek, zipping between the arching tree branches above the water with the skill of a jet fighter pilot, never touching a twig. He’s moving fast, but we get a good enough look to determine that he is, indeed, a he—only a wide grayish blue belt high across the chest, no sign of the female’s rusty belly band—before he’s out of sight. A jogger comes toward us, and we step aside again. Then we stop to peer through the brushy undergrowth between the path and the creek, studying the Mourning Doves puttering around on the far bank, noting how well their soft gray feathers blend in with the fallen leaves scattered on the mud. As we move forward along the sweeping curve of the path, I look up. Sure enough, the Red-shouldered Hawk we saw in almost this exact same spot last week has been following our progress again this morning. From his perch on a bare branch, he looks down at us with gleaming dark eyes. 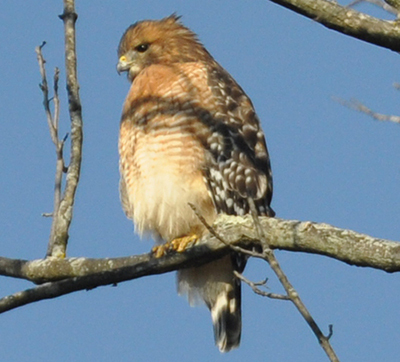 We cannot tell if this individual is a male or a female because the sexes look alike in this hawk species. The females are generally a bit larger than the males, but looking at a single bird without another nearby for comparison makes it difficult to determine. Last week someone dubbed the bird Henry the Hawk just for fun. As we take careful, quiet steps closer and closer, he turns his head this way and that, peering down at us from just fifteen feet above the path. Slowly we raise our binoculars and cameras, enjoying such close looks at his beautifully patterned feathers. Across his breast each feather has rusty bars alternating against white, creating an effect of rippling narrow stripes, as if he were wearing a stylishly knitted vest. All of his handsome feathers are fluffed out to provide maximum insulation this chilly November morning. We look at his mighty talons gripping the tree branch, the curved hook at the tip of his sharp bill, and wonder, what does he think of us? Apparently, not much. He does not change his posture, he does not utter a sound. But he keeps watching us as we move closer. We’re fairly quiet, except for the click, click, click of camera shutters, and we’re careful to not make wild gestures or startling movements forward. He just follows us with his keen eyes, watching, watching, watching. He sits still as we pass by under his perch and walk on toward the first creek bridge. When we’re about twenty feet away, I turn to look behind us. The hawk lifts up his wings, leaps into the air, and flies up, flap, flap, flap with powerful wing strokes, glides over us, looks down at us one more time, then curves away to the north, and out of sight.